Content Marketing, Content Marketing and More Content Marketing…. Everywhere you turn now marketing is all about “content marketing” Is this a new term or one based on changes in marketing? Let take a look at what content marketing really is and what it means to you. Content marketing is a marketing technique where you create and distribute relevant and valuable content to attract, acquire, and engage a clearly defined and understood target audience – with the objective of driving profitable customer action. Now, why is this the latest marketing buzz? 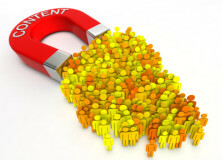 Basically, content marketing is the new art of communicating with your target market. It encourages content driven communication rather than selling techniques. We are in the generation of consumers that do not want to be sold to. Consumers want knowledge to base their buying process on. The content you provide which is relevant to them will aide in the success of their trust and loyalty to your brand. When you deliver a consistent message that is valuable to consumers ultimately you are rewarded with their business! “So how do I apply content marketing to my marketing strategy as a Photographer?” you ask. Setting up your content strategy comes first! After you answer that question you can begin to create and distribute your content. Now don’t just do social media. You will need to come up with something interesting to say to gain an audience and attention. Don’t just show up on social media, it’s not enough for your audience! Arrive with a podium and a loud speaker and boast your relevant content to your audience! For assistance with your Content Marketing Strategy contact iHeart Marketing today. Offering free marketing advice, inspiration, and direction in all of your marketing efforts!